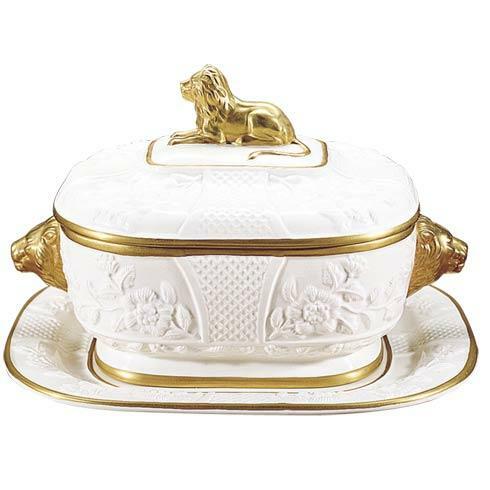 Mottahedeh ~ Lion Tureen And Stand, Price $855.00 in New York, NY from William-Wayne & Co.
A Favorite Item In The Mottahedeh Collection For Many Years, The Lion Tureen And Stand Can Be Used As A Dramatic Centerpiece On A Table As Well As Used For Serving. The Creamware Tureen Is An Adaptation Of An English 18Th Century Worcester Tureen. The Motifs Are Based On The Unusual Application Of Relief Rather Than Drawn Surface Images. The Delicate Edging Is 22 Karat Gold And Is Painted And Burnished By Hand.